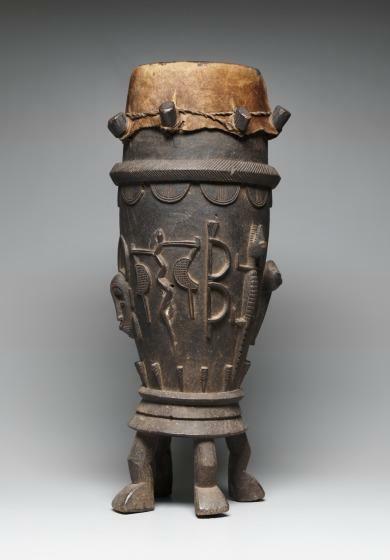 The Senufo used tall drums supported on four bent legs not only as musical instruments but also as a means of communication, much like a public address system. 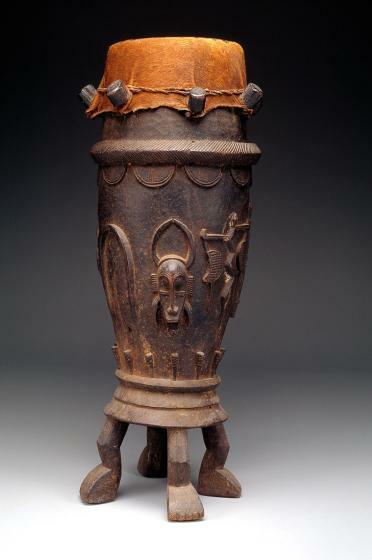 The rhythms played on drums provided a soundtrack for many activities in Senufo villages. They were played when young men prepared the fields for planting, at boys' and girls' coming-of-age rites, and at the funerals of important elders. Female drummers accompanied other women as they sang songs in a secret language to deal with gender conflicts and other frustrations. The carved imagery on this drum includes a kpeliye face mask of a men's secret society and a python flanked by birds—message carriers to and from the spirit world. 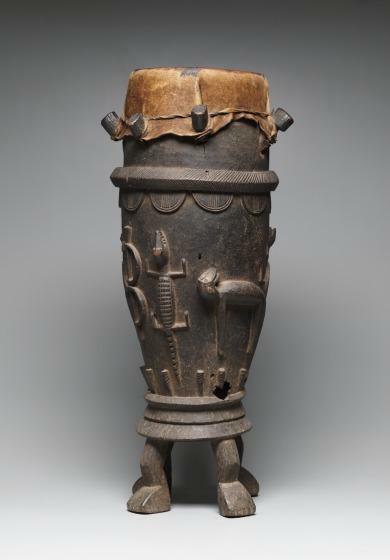 A giant lizard or crocodile symbolizes destructive forces; the turtle references water and the Creation, and the shackles refer to ancestral Senufo villagers taken captive during the Islamic jihads of the 19th century. 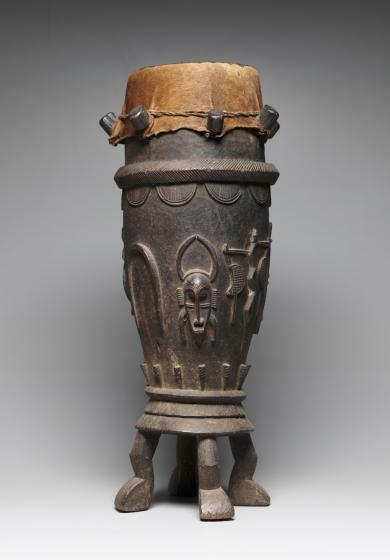 Horns containing potent medicines to heal the body and spirit are depicted around the drum. 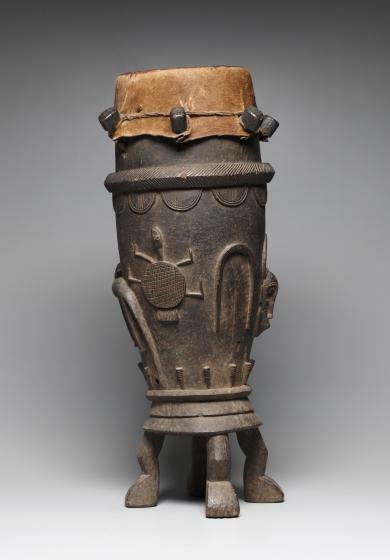 The highly stylized human legs refer to the human support required during ceremonial usage. 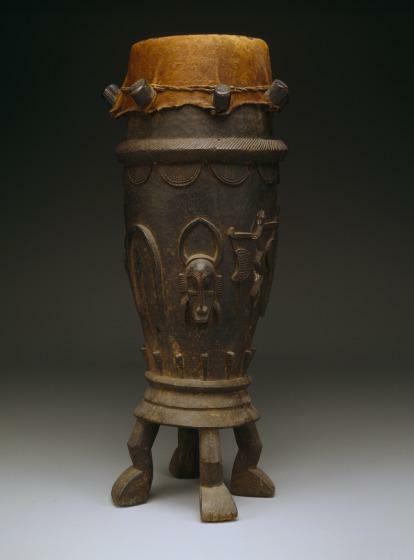 Roslyn A. Walker, The Arts of Africa at the Dallas Museum of Art (New Haven and London: Yale University Press, 2009), 176-177.